What causes a vehicle to skid on the roadway? Quick wear of the clutch and of the gearbox. When the braking forces or the vehicles inertia exceed the tire’s ability to grip of the roadway. When the engine is worn out and cannot stabilize the vehicle. How are you required to conduct yourself according to the following picture? 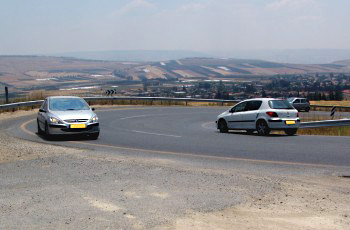 Continue driving normally, while paying attention to the other vehicles in your direction of driving. Slow down and allow vehicles to quickly bypass you from the left in order to merge into the left lane. 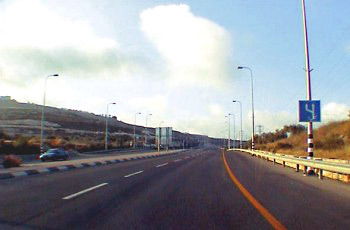 Drive on the right lane and prepare to move to the left lane as soon as the number of lanes increases. Move to the left lane, because the right lane is about to terminate. What vehicle features should be adjusted in order to ensure a comfortable and safe sitting position? The side mirrors and the radio stations. The seat’s position, the angle of the back rest, and the steering wheel position. The head rests and the position of the pedals. The seat’s position and the air flow direction from the vents. Drive down on high gear and stop the vehicle every few kilometers. Drive down on neutral gear and use the brakes according to need. Drive in an appropriate low gear and make sure that the vehicle’s special deceleration mechanisms are operating. The use of gears to brake the vehicle is of no significance. What is the imminent danger when a vehicle skids whilst driving? Loss of steering ability and loss of control over the vehicle. That the clutch and the driving wheels stop to function. Heating and wear of the vehicle’s brakes. Heating and wear of the vehicle’s tires. How would you avoid danger when starting to drive? By observing correctly the road and the traffic on it, before starting to drive. By giving a signal immediately as you start to drive. By starting to drive in high speed and quickly merging into traffic. By driving fast in reverse. Are the vehicles within the sharp curve positioned correctly? You may immediately overtake it from its right, by pulling into the “hard shoulder”. You should take into consideration that the vehicle before you might deviate to the left and you should allow it to do so. You shouldn’t overtake it on a narrow roadway, but you may overtake it from its left side on a wide road. You may overtake after using the horn to warn him. The signal he gives doesn’t oblige you. From the moment the driver eases off his step on the accelerator until the vehicle stops. From the moment the driver notices the danger until he starts to apply the action he decided to take. From the moment the driver steps on the brakes until the vehicle stops. From the moment the driver notices the danger until the vehicle makes a complete stop. Don’t worry: The overtaken vehicle should deviate to the right and allow you to overtake it easily. You are commiting a traffic violation! This type of overtaking is illegal. You take a risk of another vehicle appearing in the opposite lane. This type of overtaking usually last 30 seconds. The risk of skidding on a wet road is identical to the risk of skidding on a dry road. The newer are the tires. Only when the weight of the vehicle in front is more than 4 tons. On a steep descent and only after a “dangerous descent” sign. Because it might brake suddenly. Why is it important to drive on the right side of the road? It allows you to be assisted by the yellow line for driving in a straight line. It qllows vehicle passengers to easily exit the vehicle. 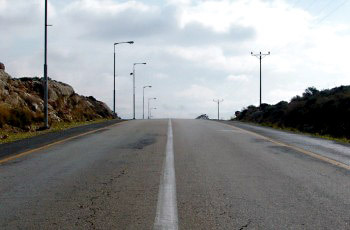 Driving on the right side of the road is of no significance, except for one-way roadways. 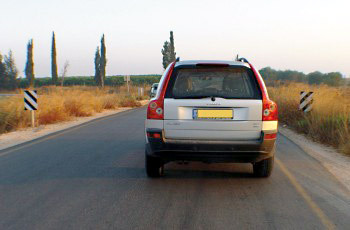 In order to keep a distance from incoming traffic from the opposite direction, and reducing the risk of “head on” collision. What shoukd a driver check after driving through deep water on the road? If the brakes work efficiently. No need of any of the cheks. What is the most important principle when turning right in an intersection? To start and to complete the turn close to the right edge of the road. To stay away from the road’s right edge. To turn as far as possible from the right sidewalk. To enter and exit the intersection in a wide arc to the center of the roadway. What is the advantage of driving on the right side of the road? It prevents the vehicle behind you from overtaking you. You create a safety distance between yourself and oncoming vehicle traffic. 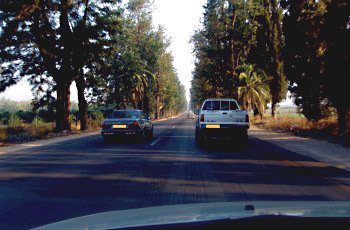 There is no advantage in driving on the right side of the road, except for one-way roads only. You Stay within the permitted distance of no more than 40cm from the road’s edge. Cross the bridge as quickly as possible, to allow vehicles coming from the opposite direction to pass it without delays. Slow down while approaching and crossing the bridge. Stop before the bridge for safety reasons and then cross it quickly. 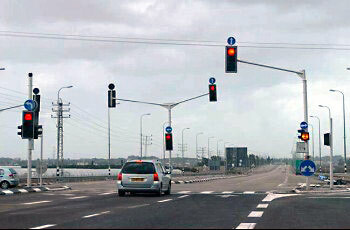 Drive faster only while approaching the bridge, and drive slowly on the bridge – in order to enhance safety. How would you get the attention of the overtaken vehicle’s driver while overtaking on a freeway (motorway)? Use the horn for as long as you are passing him. It is important that he doesnt ignore you. You are permitted, if it is necessary, to use the horn briefly before passing, . During day light, turn on the vehicle’s parking lights. If required, signal to him with the vehicle’s four direction indicators. How is the required distance for overtaking determined? It only depends on the driving speed of the overtaken vehicle and not of the overtaking one. It only depends on the driving speed of the overtaking vehicle and not of the overtaken one. It corresponds to the speed limit in that road section. 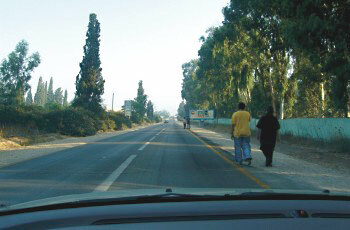 What is the imminent danger in the following road section? Limited field of vision while overtaking vehicles in front of you. Engine overheating due to the steep climb. The appearance of a vehicle coming from your opposite direction in your driving lane. The crossing of a separation line and inability to return to the roadway’s right. What is a reasonable speed on a freeway(Motorway)? A speed that takes into account traffic conditions, and that doesn’t exceed the permitted speed limit on that road. In any case, not less that the allowed speed limit. A speed that gives you maximum drive range, provided that it doesn’t exceed the speed limit. At the driver’s discretion, provided that it doesn’t exceed the allowed speed limit. How are you required to conduct yourself in the following road conditions? Stay in low gear while keeping to the right. Turn on the high beam, because of the shadow on the roadway. 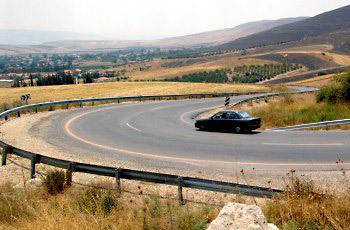 Enter the curve carefully and increase speed when going downhill. Honk, because of the obstructed field of vision in the curve. 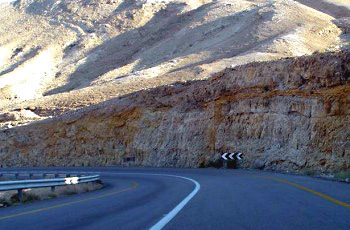 How can you avoid frontal collision while driving on a narrow and winding mountain road? Drive close to the middle line. Slow down and honk continuously before every curve. Drive on the far right of the roadway, turn-on the lights, and adjust your speed to the road’s conditions. Drive in high gear and don’t use the brakes much, to avoid loss of braking ability. Which type of vehicle is allowed to stop or be left standing on the hard shoulder of an inter-urban road which is marked as a main road? A work vehicle or a tractor. A vehicle engaged in selling fruits and vegetables to passersby. A vehicle engaged in public works and an I.D.F vehicle - for the purpose of fulfilling their duties. A towing vehicle and a trailer, a truck tractor and a semi-trailer, with a maximum width of three meters. What is the correct order of actions while reducing the vehicle’s speed? Slowing down by stepping on the clutch pedal and shifting to higher gear. Slowing down and shifting to lower gear. The order of actions is of no importance during vehicle deceleration. Shifting to lower gear and stepping on the clutch pedal. What are we required to ensure before starting to drive? That the fuel and oil types are those required for the proper operation of the vehicle. That we can operate and use the vehicle proficiently. That the vehicle has spare bulbs and fuses. That the vehicle received all the treatment necessary for its current maintenance.